Editor’s note: Atherton resident Gillian Bostock is not only a talented, serious-amateur chef, she’s also an accomplished photographer. This is the fifth in her series of great summer recipes. I must confess straightaway that this recipe is technically not my own but my great-aunt Gussie’s. Aunt Gussie lived in Marshfield, Wisconsin for the majority of her 94 years and grew her very own raspberries in her backyard, amongst other fruits and vegetables. Of all the things to have been made from her garden, however, her raspberry jam was the most coveted. 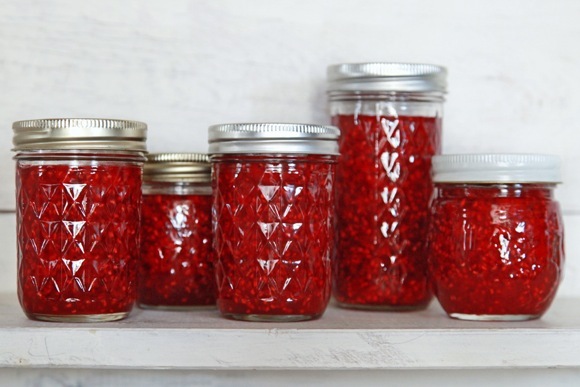 Jars of her raspberry jam were treated like ruby amulets. And if Aunt Gussie gave one to you, it was a sure sign of her most sincere affection. At Aunt Gussie’s house, raspberry jam was served (rather extravagantly) in a crystal bowl at nearly every meal — breakfast, lunch, and dinner — throughout the year. In the cold winter months of Wisconsin, the taste of summer raspberries was especially appreciated. Truth be told, her secret was that the jam was in fact “freezer jam” which allowed the color and flavor to stay particularly vibrant. 1. Place raspberries in a large heatproof bowl and crush them slightly with a wooden spoon. 2. In a large saucepan bring to a boil water, sugar, and Sure-Jell Light. Boil for one minute while stirring consistently. Remove from heat. 3. Pour mixture on top of the berries and stir for one minute until well combined. 4. Pour into jars leaving some room at the top. Screw on caps. Date jars. 5. Let jars sit out at room temperature for 24 hours and then put them into the freezer. Makes 8 jars of jam. Thaw overnight before using.